Now we would assume these are to be made specifically for you, from a set of measurements taken from your feet and legs. Your Podiatrist will also have taken a video of your walking and or running pattern. They will have watched how you stand walk run and tested muscles and joints. Your Podiatrist will have also taken a cast or better still a 3 dimensional scan of both your feet – to be truly custom made this is essential! If your podiatrist or other practitioner has NOT done these things then frankly I would question if you were truly getting a custom made or true prescription orthotics! Orthotics are costly, they are in the same ball park as prescription glasses and at times the same price as some mouth plates Dentists use to correct small alignments for your teeth. Thankfully NOT as expensive as braces though! I would suggest that they are this expensive because, if they are truly prescription custom made orthotics, the time that it takes to make a pair is reasonably extensive. Add to this the cost of your practitioner’s time taking the measurements then preparing the prescription and then finally check-ups fittings and etc and it will quietly add up. We have noted a few podiatrist tell people the cost of the device only. 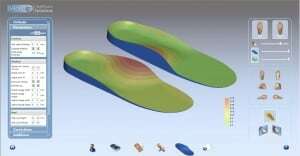 For example “orthotics cost $400” but be warned it is a good idea to ask about associated the cost of appointments. How about check-ups? You know your feet are ok on the first check, but 4 months later your orthoses don’t feel right. We always give free check-ups for our patients for the life of your device – if its 2 years then so be it! We don’t believe you should have to pay for a check-up of your device if there is a problem. If your friend a relative or any type of patient of ours says they are not comfortable or not happy PLEASE send them back to our clinic – it’s free and we are ALWAYS happy to see them!! It’s included in the cost of the devices and appointments whenever we fit you with orthoses at A Step Ahead Foot and Ankle Care. We guarantee our devices – if they flatten out, warp, the covers fall off or somehow otherwise your orthoses die an untimely death in the first 12 months we will replace your orthoses! Now you’d think this is common sense BUT if your dog eats them (don’t laugh has happened numerous times) that’s your responsibility, we will always be reasonable and we hope our patients are as well. So there is much more than just a custom orthoses that’s in your shoe… it’s a long process of getting this very specialised device right. As we have discovered they are very specialised devices made from very specific measurements. What we have not spoken about is the very detailed equipment which makes up the mill that manufactures the devices and how that works. That I thought we would speak about next time.